WEAR COMPONENT™ | Conveyor Belts | Products | Bando Chemical Industries, Ltd. 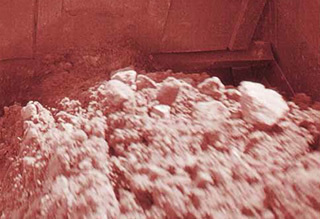 Dump trucks, unloaders, hoppers, skip loaders, conveyor chutes, feeders, etc. product types shown to the right. 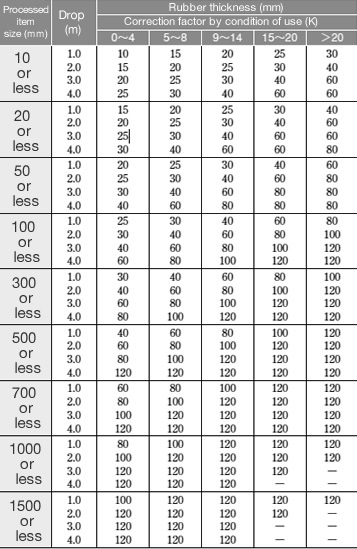 Select the product type referring to the following table in accordance with the equipment where the product is installed. ◎：Block Liner applicable. ○：Install ML crosswise when a longer life is desirable. △：Applicable. However, partial abrasion may occur. ×：Mold required. Design with higher durability is possible with a higher bar height. 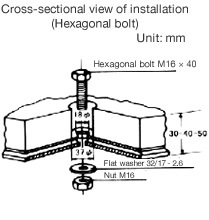 For the same area, Type ML requires less bolts than Block Liner does. The flat lining mostly prevents sticking. The ease of installation is equivalent to a steel liner. Partial repair is easier than that of Type ML. The continuous sheets mostly prevent sticking. Easy to fit with a cone hopper. 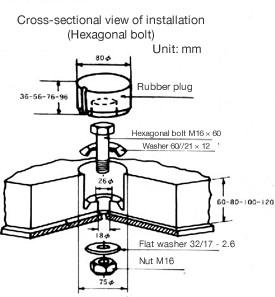 the rubber thickness is 100 mm. the descending speed and the abrasion. severe abrasion, higher durability and economy can be obtained. 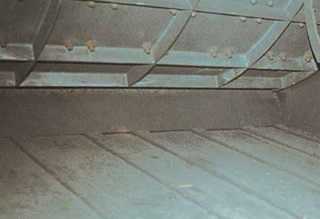 the same rubber liner specifications increased the life four-fold. The figure on the right shows crosswise installation of Type ML. 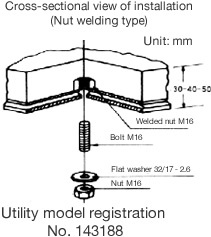 Installation bolts, nuts, and flat washers are also required. 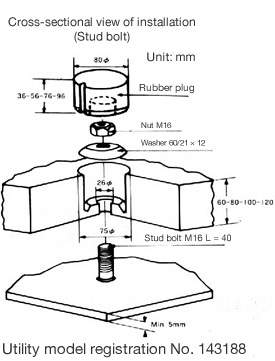 (Note) The standard bolt is M16. When a large impact is applied, please use M20. 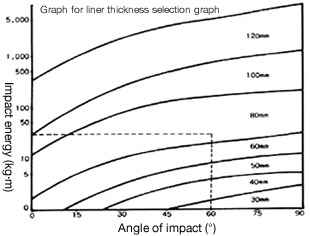 20 kg (weight of rock) × 1.5 m (drop) = 30 (kg·m) Plotting this as the impact energy of the vertical axis in the right figure, the point where it meets with the 60° angle of impact in the horizontal axis indicates that the liner thickness to select is 80 mm. When the specific gravity is 3 or greater, or when the quantity of the processed items is significantly large, select a thickness thicker by one rank. The impact energy indicates the maximum weight (kg) × drop (m) of the processed item. The angle of impact indicates the angle (α) in the right figure. The graph for liner thickness selection in the upper right section shows the case when the specific gravity of the processed item is 3 or less.